I enjoy bringing a motivational presentation to corporate and civic groups. 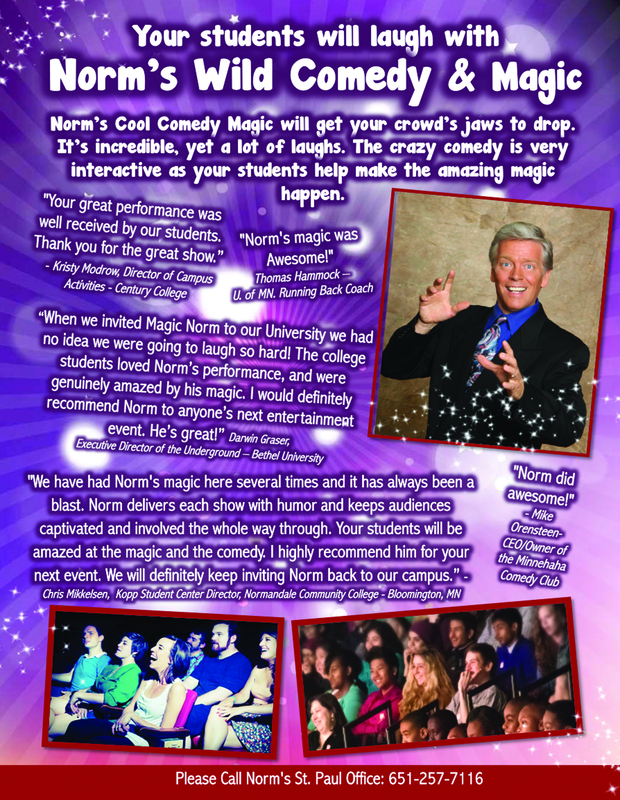 It is also fun to bring comedy to colleges in Minnesota. I find that the students need a break from the stress of homework and studies. Laughter helps relieve stress, clear the mind and make one ready for more intense study and effort. It is a good break that lifts the spirits and encourages a student to get back at the goals set. I enjoy hearing the laughter that results from my appearances for college students. It is also fun to bring an inspiring message to corporate awards events and staff development days. However if you are looking for something very fun for your company party – please consider the clean comedy I present for parties and social hours. It has been a busy year and I look forward to bringing some light-hearted humor and motivation to your group. I am enjoying a night in beautiful and windy St. Cloud. Tomorrow morning I do a keynote presentation for a business group. I have been racing so much lately that I have been very behind in this blog business. January had 6 corporate events for me as well as several family shows. I am thankful to be busy. I was sad to see that the Ground Round Restaurant in St. Cloud, MN is now closed and up for sale. It is the place where I got my first job as an entertainer over 30 years ago while in high school. I had looked forward to enjoying dinner there tonight and was sad to find the doors closed. I passed by the restaurant about 2 months ago and saw it was still open. They had a long run and offered very good food, but even the best of them sometimes find it hard to stay in front. Lessons: Never assume business will always be there. Work to keep old customers happy and draw new ones in. Find ways to make your old customers you allies in the search for new customers. maybe a special coupon for invite a friend to the restaurant and you both share an appetizer free. Finding a new customer through advertising costs more than holding on to a existing customer. Find ways to give excellent service to your existing customers so that they will rave about you to their friends. I hope the Ground Round will come back with new ownership. But if the new restaurant has a new name I hope they do well too. They have an excellent building to work in. Favorite memory of the Ground Round having a free lunch there after doing a show and my favorite waitress would always play her favorite song on the jukebox… The Eagles – Tequila Sunrise. She was older than I – probably a college girl and I was 16, but now looking back she must have had some sadness as that is quite a song about lonelyness.